Looking for garden tools near Harrogate? 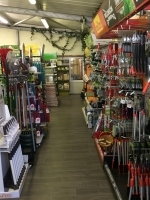 We have a superior variety of garden tools near Harrogate than any other garden centre in the county. At Thirsk Garden Centre, we have always used variety as a feature of our service quality. When you visit our nursery for your garden essentials, you will be able to find even the unusual tools you want for a special project in the garden. We make sure our customers find the tools and instruments they need in our stock, and this is our biggest achievement in business. A spectacular garden is the one that looks neat and pruned. For all the tasks related to making the garden look pristine, we have a wide range of hand tools near Harrogate that you can order and use. From hand-held pairs of secateurs to anvil shears, trowls, pruners, fruit pickers, saws, and a lot more, we have the hand tools you need for your garden in Harrogate. Digging is the first step for just about any project in the garden. For this reason, we have a broad range of digging tools near Harrogate displayed in our stock of gardening tools. From Dutch - and swoe style - hoes and prong cultivators to edging blades, border forks, and digging spades, we have everything in our stock ready to go to work in your garden. Since cultivating tools near Harrogate have their own set of functions and special uses, we usually categorise them separately. Our stock of cultivating tools includes grubbers, pull weeders, multi-purpose hoes, small draws, and much more. Whether you have flowering plants and shrubs all across your garden or a combination of plants, shrubs and trees, our collection of cutting tools near Harrogate will take care of your needs. From pruning your favourite rose plants with a pair of anvil pruners or reaching the furthest branches on your maple tree with our extended telescopic handles, we have every cutting tool near Harrogate available in our stock. To further help you with your exercises in the garden, we have a variety of tools and accessories available in our garden centre. These include kneelers, tool bags, boot pulls, plastic blades, and much more. Our stocks are carefully built and the suppliers we select for our nursery and online garden centre are picked after careful tests and a detailed evaluation of their reputation in Ireland. With such immaculate examinations, we already have quite a number of brands in our inventory that gardeners in Ireland trust. These include ALM, Apollo, Burgon and Ball, Fiskars, Gardman, Gruffalo, Hozelock, Kent & Stowe, and Yeoman, just to list the most popular ones. When you visit our nursery, take expert advice from our team members who will be happy to help and guide you to the perfect items. Visit us soon for your garden tools near Harrogate! Garden tools are also nice gifts.